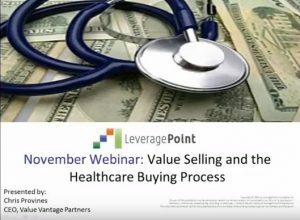 The healthcare buyer has moved from basing their purchasing decisions purely on clinical considerations to a balance of clinical and economic buying considerations. This shift can cause a 10-40% savings from various supply categories. To overcome this challenge, healthcare suppliers will need to clearly communicate the clinical benefits and economic value that their products provide to customers during each phase of the buying process. Based on insights from his popular new book, Healthcare Value Selling: Winning Strategies to Sell and Defend Value in the New Market as well as other works on Value Selling, Chris will provide proven strategies that will enable sales reps to better understand their customer’s buying process and communicate value during each stage of the buying process. Chris Provines is Founder and CEO of Value Vantage Partners, and is an accomplished executive, business advisor, and adjunct professor with broad global experience in Fortune 500 businesses. His experience includes global leadership roles at Johnson & Johnson and Siemens in commercial excellence, strategic pricing, account management, procurement, and business improvement. As an advisor, he helps businesses grow profits through smarter pricing and commercial execution. He is also a top-rated instructor teaching marketing and sales teams strategic pricing, selling and negotiating value, and value discovery.